The dead body a two-year-old boy who had fallen down a well in southern Spain was found on Saturday morning, said Spanish officials. 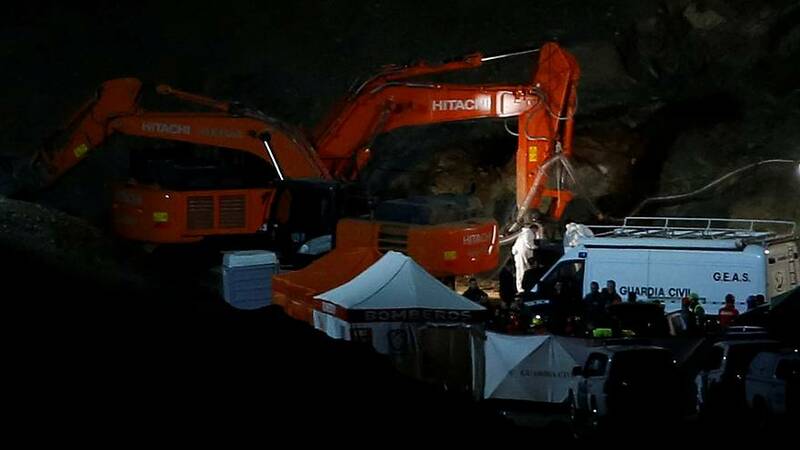 Rescuers had launched a massive drilling operation to look for Julen who fell into the 100-metre deep borehole on January 13 as his family was walking through a private estate in the town of Totalan. In their efforts to find the boy, rescue teams drilled a parallel shaft to the well, from which miners tunnelled the final four metres. Euronews correspondent Cristina Giner said that after the emergency call of Julen's parents nearly two weeks ago, a court in Malaga opened legal proceedings. At 4:00 a.m. a mortuary van left Totalan with Julen's body. Four hours later, medics had started performing an autopsy on the boy's body, said Alfonso Rodríguez Gómez de Celis, spokesman for the government of Andalusia. "The autopsy started at 8:30 a.m. this morning and in the course of the day we will be able to have a result," he said. Once the autopsy is finished, results will be communicated to judicial authorities in charge of investigating the circumstances of the events occurred in the family farm where the toddler fell. The Spanish Ministry of the Interior tweeted their condolences to Julen's parents and thanked the rescue team for their efforts to find the boy's body. Spain's Prime Minister, Pedro Sanchez, also tweeted his condolences to the family and thanked the rescue team for their "tireless effort".